Citronella oil is one of the essential oils obtained from the leaves and stems of different species of Cymbopogon (lemongrass). The oil is used extensively as a source of perfumery chemicals such as citronellal, citronellol and geraniol. These chemicals find extensive use in soap, candles and incense, perfumery, cosmetic and flavouring industries throughout the world. Citronella oil is also a renowned plant-based insect repellent, and has been registered for this use in the United States since 1948. The United States Environmental Protection Agency considers oil of citronella as a biopesticide with a non-toxic mode of action. Insect repellents help prevent and control the outbreak of insect-borne diseases such as malaria, and dengue fever. Citronella oil has minimal or no risk to wildlife and environment due to its toxic levels being low and its use being limited. Therefore, it can be used around the home with no expected adverse effects. Research also shows that citronella oil has strong antifungal properties, is effective in calming barking dogs, and has even been used as a successful spray on deterrent against pets destroying household items. 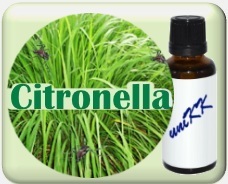 Citronella oil repels insects such as mosquitoes, black flies, fleas and ticks, therefore, preventing its bites. It is used on humans and their clothing – in the form of an oil, liquid and patch. Citronella oil is a natural, non-toxic alternative to chemical insect repellents such as DEET , therefore, is usually the preferred choice. Also available are solid products such as citronella oil insect repelling candles and cartridges. Citronella oil is also used in a tablet or pellet form in recreational or outdoor household areas and around trees and shrubs. In addition, there are animal collars and tags containing citronella oil for pets and other domestic animals to repel fleas. A combination of the citronella oil and cedarwood virginian oil also helps to repel mosquitoes. Citronella oil, an essential oil, possesses activating and warming qualities both physically and mentally.The aroma is said to be like its relatives lemongrass and palmarosa. However, citronella oil is overlooked in aromatherapy because of its association with insect repellency. When citronella oil is diluted properly in a base oil and is applied to skin, it produces a mild sensation of warmth – which relieves painful muscles and joints. Mentally, the aroma of citronella oil may help with nervous fatigue due to its clarifying properties. It can also ease pressure of migraines and headaches. Citronella oil blends well with cedarwood, orange, geranium, lemon and bergamot - however, you should only use essential oils under those specialised in the field. It is safer to consult a qualified aromatherapist if ever in doubt. Citronella oil is an astringent and if used correctly it may help with oily skin areas. Use a single drop of citronella oil on the skin (usually inner forearm) to test for irritation. Apply two or three drops of citronella oil to a cotton ball and gently wipe off the excess oil. Then complete your regular facial routine. The Java citronella oil is one of the most widely used perfume oils and is often used as a starting point for perfume materials, as its constituents citronellal and geraniol are important and widely used perfume building blocks. Eating a diet heavy in onions and garlic can make you unattractive to mosquitoes. Curiously, mosquitoes seem to be more attracted to people who consume diets high in sugary or processed foods. Eating a diet rich in whole grains, vegetables, and fruits may help reduce your attractiveness to mosquitoes. Some people believe consuming Vitamin B-1 (thiamin) tablets helps to ward off mosquitoes. The first step and most effective way to reduce the number of mosquitoes around homes and neighborhoods is to find and eliminate their breeding sites. This will terminate the mosquito breeding cycle as well.